Between 8 and 10 people sporting Jefferson T-shirts and iPads were posted on 10th St. between Walnut and Sansom around midday today. These folks were asking passing pedestrians to take a short survey and entering the results on the tablets. "Did you travel on 10th Street today?" "What did you think of the traffic? Good, bad or neutral?" "Do you think the bike lane made it better, or worse, or had no effect?" 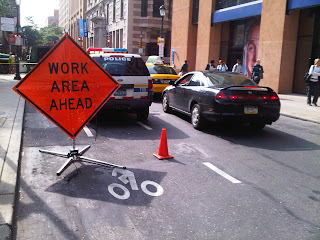 It's worth noting that there was a utility crew in the middle of the left-hand buffered bike lane at Sansom Street, causing traffic to slow down to a crawl. Ha! I really like the illogic behind this. "Do you think this really dangerous thing is now more dangerous because we made it less dangerous?" Shouldn't the idea of an auto-free secondary travel lane be very appealing for emergency vehicle access? I just can't wrap my head around the backlash. "Wow, this nimble bicycle is really in my way. If only it could be a double-parked Hummer!" I hope this issue gets resolved. Big institutions with lots of money are very good at creating pseudo-science to override public understanding of real science. Yesterday, in the west lane (right in front of the major hospital building) there were many cars without drivers parked, 2 delivery vans (and a red cross van I'm not counting). Today, at 9:15 there were 6 cars, a delivery van, a construction van and a police car parked in the west lane. Someone was double parked in the middle lane. Nobody was in the east/turn lane - including bikes. Not a single bike, not a single car. Traffic backed up due to the double parking and backed up when the traffic light at Sansom changed. I think that, if the city plans to do anything to the bike lanes, they ought to make them safer. I like the idea of "going green." Lets ensure that all other green-concious people are safe too. I utilize the bike lanes as much as possible, but find so many bike lanes fading away, or CARS in it. Why can't the city paint all the bike lanes green, like they did on the South Street Bridge crossing? Cars don't get a ticket for waiting/driving in the bike lane, but I'll get a ticket for getting out of harms way to ride on the sidewalk. I know I shouldn't, but you cannot blame me. I was cut off by, just about, everyone and their grandmother in one day. I'm sorry, I value my life, not your $50+k car. The tickets you can shove it. Paint the bike lanes!!!!! Or start giving tickets to C A R S for making the roads UNSAFE. Seriously, I was cut off by a UCD truck, a large Septa utility truck, and grandma pulling into Whole Foods and she had just passed me to pull into the parking lot. The UCD truck forced me into a curb and the Septa truck turned into the circle at the art museum too early, pushing me towards Kelly Drive. You know, other cities like NYC put up permanent traffic cones and paint their streets. Hintidy hint-hint.